Introduction Earthquakes continue to make headlines worldwide. Recent earthquakes in coastal California near San Simeon (magnitude 6.5; December 22, 2003; 2 killed) and in Bam, Iran (magnitude 6.6; December 26, 2003; more than 40,000 killed) dramatically demonstrate how earthquake risk depends not only on earthquake size, but also on the number of people living near the epicenter and on local building and land-use practices. Because Utah’s population is concentrated along the Wasatch Front in the state’s area of greatest earthquake hazard, wise building and land-use practices based on a thorough understanding of earthquake hazards are essential. Earthquake hazards include a wide variety of damaging geologic effects, including strong ground shaking, surface faulting, liquefaction, and landslides. Each of these hazards is unique in how often and where it occurs, how damaging it is, and how well scientists understand it. The Utah Geological Survey (UGS) performs and supports others performing studies to better understand each hazard, show it on hazards maps, and use the information to reduce risks. To help set priorities for earthquake studies in Utah, and in particular to develop a consensus among experts on earthquake-hazards mapping needs, the UGS in cooperation with the U.S. Geological Survey (USGS) has established formal Ground Shaking, Liquefaction, and Earthquake- Induced Landslide Working Groups to define research programs to produce new earthquake hazards maps. The working groups include geologists, engineers, seismologists, and geophysicists from Utah State University (USU), Brigham Young University (BYU), University of Utah (U. of U. ), UGS, USGS, and various consulting companies and other state agencies. Working groups met in early 2003 and agreed upon the types of maps needed, new data required, and data-collection and mapping techniques. A summary of the process, funded through a grant from the USGS, and final working group plans for future earthquake-hazards maps are posted on the UGS Web site (geology.utah.gov). In a parallel process, the UGS established the Utah Quaternary Fault Parameter Working Group, also partially funded by the USGS, to develop a consensus among paleoseismologists regarding earthquake timing, slip rates, and recurrence intervals for Utah’s Quaternary faults. Quaternary faults are those that have moved in the past 1.6 million years and thus are considered capable of producing modern earthquakes. Fault parameters such as earthquake timing, slip rates, and recurrence intervals are important in making the probabilistic earthquake groundshaking maps used in the International Building Code (IBC) and in the design and retrofit of bridges and dams in Utah. Fault experts from the UGS, USGS, U.S. Bureau of Reclamation, other state geological surveys, and various universities and consulting companies have analyzed fault-trenching data and met to develop consensus values for the important fault parameters. In addition to causing earthquakes and resulting ground shaking, faults may also rupture the ground surface in large earthquakes (magnitude 6.5 and greater). Surface fault rupture beneath a building may cause severe damage and possible collapse, and represents a life-safety as well as property-damage concern. 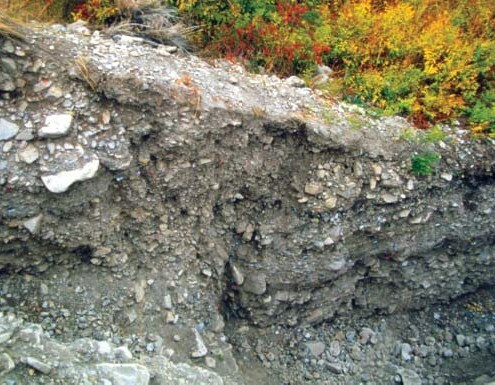 The article in this issue on the new UGS guidelines for evaluating surface-fault-rupture hazards provides more information on this hazard in Utah. The central segments of the Wasatch fault from Brigham City to Nephi (see map on page 4) are the most active faults in Utah, and the most likely sources of the next large earthquake. Geologists have mapped and trenched these central segments, but similar detailed studies have not been performed on the northern and southern segments. The UGS is presently mapping the Levan and Fayette segments at the south end of the Wasatch fault to better define their location and level of activity, and the U. of U. is studying the next segment to the north, the Nephi. The destructiveness of earthquake ground shaking depends not only on the size and location of the earthquake, but also on local geologic conditions that can amplify or reduce levels of ground shaking. The soil type in the upper 100 feet of the soil column, deeper soil conditions, and depth to bedrock are all important in estimating levels of ground shaking. The prime soil characteristic used to estimate earthquake ground-shaking amplification or reduction is shear-wave velocity, or the speed at which earthquake-generated shear waves pass through the soil. The IBC uses this soil characteristic in estimating ground motions for earthquake-resistant building design. The UGS, in cooperation with BYU engineers, developed a database and map of Salt Lake Valley showing soil types in the upper 100 feet grouped according to average shearwave velocities based on existing data. To improve the map, USU, with assistance from the UGS and U. of U. Seismograph Stations, is collecting additional shallow shear-wave-velocity data using geophysical techniques. USU collected data at 44 sites along the Wasatch Front in 2003. The geophysical equipment used by USU uses a drop-weight to artificially generate shear waves, and records them on geophones strung in a line about 300 feet long. 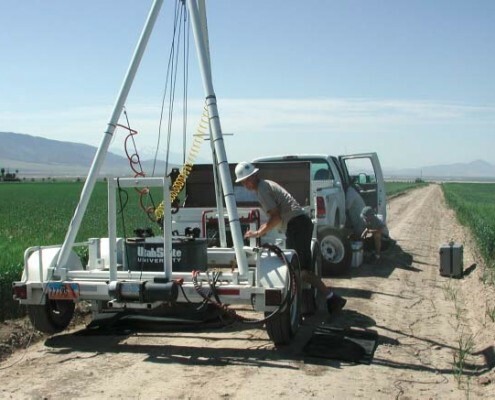 The system can measure shear-wave velocities of soils to depths of up to 150 feet. On a basin-wide scale, the depth and configuration of bedrock and semi-consolidated sediments deeper than 100 feet also affects the degree to which seismic waves, particularly low-frequency (long-period) waves, are reflected within the basin and amplified or reduced. The UGS has compiled a database of existing information regarding deep-basin structure and depth to bedrock, which includes deep water wells and oil-company seismic lines (mostly in and around Great Salt Lake). To better characterize this deep-basin structure, the USGS performed a 2-mile-long seismic-reflection survey in South Jordan along 3200 W. Street in September 2003. The USGS system uses a “vibroseis” truck that literally shakes the ground in a manner similar to a small earthquake. Geophones strung along 3200 W. Street recorded the shaking, and analysis of the records determines shear-wave velocities and depths to bedrock and semi-consolidated layers down to about 2500 feet. This information on shallow shear-wave velocities and deep-basin configuration will ultimately be used to generate a “community velocity model.” This 3D model will depict Salt Lake Valley’s shape and shear-wave-velocity profile at any given location, and will be used to improve seismic design of buildings and bridges. The USGS funded the U. of U., USU, and UGS in 2004 to develop state-of-the-art Geographic Information Systems (GIS) methods to make probabilistic liquefaction potential and liquefaction-induced ground failure maps for the Wasatch Front. The project will focus on northern Salt Lake County and will begin by compiling a geotechnical database from existing consultant’s reports. The database will be used to produce GIS maps, geologic maps, and to assess both liquefaction potential and the type and amount of associated ground failure (settlement, lateral spreading, flow failure). Large earthquakes in mountainous areas typically generate hundreds to thousands of landslides, mostly rock falls but also larger slides and flows. 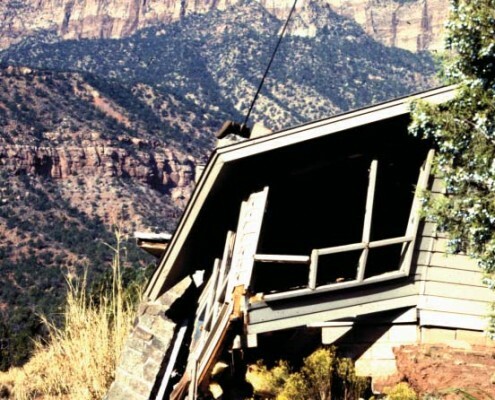 Historically, magnitude 5 and larger earthquakes in Utah have generated many rock falls, and the 1992 magnitude 5.8 St. George earthquake generated a massive landslide in Springdale, 27 miles from the epicenter. 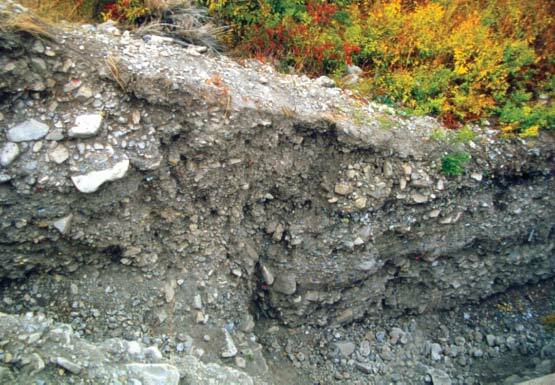 Along the Wasatch Front, little is known regarding the earthquake-induced landslide hazard, and the Earthquake-Induced Landslide Working Group recommended several studies to improve our understanding. The UGS has compiled a database of geotechnical soil shear-strength tests from landslide studies throughout Utah to characterize geologic units for generalized landslide- hazard mapping and to indicate where more data are needed. As a pilot project, the UGS is studying several landslides in Salt Lake County and nearby Wasatch Front areas to determine whether they may have been generated or reactivated by earthquakes. One goal of the project is to date landslide movements and compare them to the timing of known large earthquakes determined from fault studies to assess whether the landslides may have moved as a result of earthquakes. 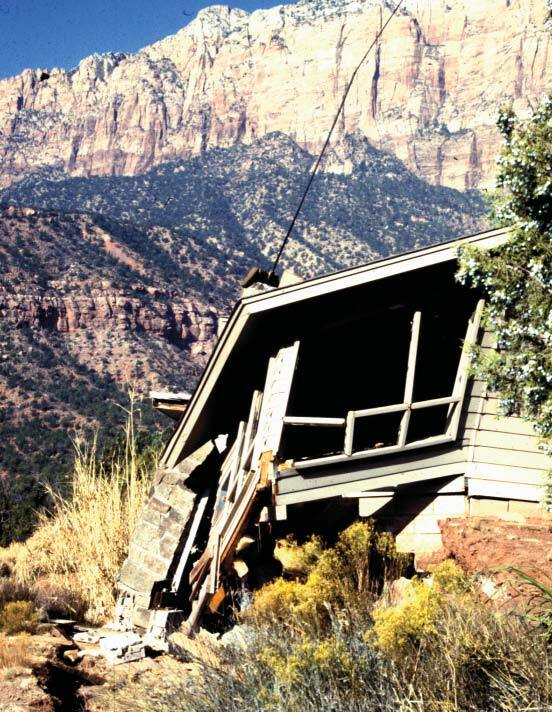 Much work regarding earthquake hazards is underway in Utah. Cooperative efforts between the UGS and USGS, including establishing interdisciplinary earthquake working groups, have helped direct and coordinate studies. In addition, the USGS has performed independent studies as well as being the principal funding source for many other projects. Researchers presented the results of ongoing earthquake studies at the UGS-sponsored Earthquake Conference in Salt Lake City on February 26, 2004. The following day, working groups met to update plans (see UGS Web site for updated plans) and coordinate 2004 cooperative studies and 2005 proposals. These efforts are greatly improving our understanding of earthquake hazards, and ultimately will improve our ability to reduce risks in a cost-effective manner.